Gush is the Vintage Magic equivalent of the Wonderlic test. How a player views Gush as a card is indicative and suggestive, although not determinative (by any means), of their Vintage IQ. If a player looks at Gush, and is either unimpressed or thinks it’s simply not that good, it is only a matter of time until they are proven wrong. If a player doesn’t know how to play Gush, and fumbles around with it in testing, it’s guaranteed that they will underestimate it. If a player casts Gush on turn two, and passes the turn without doing anything else meaningful, they are GushFailing. In many respects Gush is a test of a true Vintage master. The best Vintage players know and have always known how powerful Gush truly is. They respect it and abuse it. This is more so now that so many parts of the old GushBond engine have been restricted. Gush is now only a menace in the hands of the most experienced players. It is a card that separates the wheat from the chaff. With this reality now manifest, consider the fact that Gush has been unrestricted since October 2010. Yet, it took until the Vintage championship in August 2011, nearly a year later, for the Vintage community to awaken to its true power; for Rich Shay and others to demonstrate and remind players of Gush’s true place in the Vintage pantheon. How many players have wisely used that time to hone their Gush skills? How many have played Gush decks, or at least tried them, in the interim? Gush is a card that is so tricky to use that I wrote a full book on the subject. Of course, the book isn’t just about how to play with one card or how to maximize the advantages of Gush, but how to build a deck around it, and how to interface Gush with other critical strategic goals. It’s a complete guide to playing Gush decks, not just the card Gush. Writing a book about Gush is daunting because there are so many foundational principles that have to be mastered before you can get to the good stuff. For that reason, I teach Gush from the ground up, starting with how to play Gush and when to use it (discrete rules for play and sequencing are provided). The first chapter does that, not only instructing the reader on these fundamental mechanics, but explains the reasoning behind them with illustrative examples. The book then moves on to topics such as how to protect Gush, how to build a deck around it, and how to play your deck to maximize every advantage that can be gained from using Gush. Finally, the book addresses the most sophisticated topics such as how to build towards strategic goals, how and when shift roles within games and between matches (I’ve even created a flow chart), and addresses all of the nuances of mana management, from which colors of mana to float when playing Gush to the three essential principles of mana development. For those of you who have read my book, consider this an addendum. For those of you who haven’t read my book, consider this a peek into the world of Gush decks, and a snapshot into one of the most interesting areas of Vintage play and design. This deck represents the modern incarnation of the Empty Gush deck piloted in 2007. It is a focused Gush deck that emphasizes the best cards available in the modern Vintage card pool, and is strikingly similar to the list that Owen Turtenwald suggested around this time last year. The first thing to note about Shawn’s deck is that it attempts to abuse, about as much as a Gush deck can, the best unrestricted blue draw spell besides Gush: Jace, The Mind Sculptor. The only Gush deck to run this many copies of Jace before this was my Tyrant Oath list. Shawn’s deck maximizes the critical turn blue spell, whether it be Gifts Ungiven or Jace, the Mind Sculptor. What Shawn has discovered is that Gush supports these big game plays. Jace, the Mind Sculptor, it turns out, has fantastic synergy with Gush. This point was not sufficiently emphasized in the 2nd Edition of Understanding Gush, nor was it recognized by Owen. Gush synergizes with Jace in three critical ways. First, Gush helps provide the mana to play Jace. The first rule of playing Gush, as described in Chapter 1 of Understanding Gush, is to wait until turn three to play Gush. The rationale behind this rule is to maximize the mana advantage of Gush, giving you access to three total mana from lands on turn three instead of just one. This rule maps well to the Jace plan. Generally, Jace is a turn three play (3 lands and a Mox, for example). Gush can serve as a mini-accelerant, giving you the mana to make your third land drop (that is, replaying a land you had already played this game). Fetchland into Island, Mox, Preordain. Float UU, cast Gush (returning Island and Underground Sea to hand), then replay Island, and cast Jace, the Mind Sculptor. Here, Gush has given you the third land drop needed to cast Jace. But observe that Gush has also performed another role. It helps protect Jace, and aids in its resolution. It does this in two ways. First, if Gush resolves, it’s drawn you additional cards, cards which may be used in service of protecting your Jace from an opponent’s countermagic. For example, if it draws you into a Force of Will, you can use the Force to shield Jace. Alternatively, if you draw a Mox, you can play the Mox and then use your additional mana to play Spell Pierce, Red Elemental Blast, or a Duress effect, to help protect and resolve Jace. Finally, the Gush may in fact draw the Jace itself, which you would like to play here. However, if Gush is countered, Gush has served a vital role of both drawing out opposing countermagic, generating mana advantage, including the third turn land drop to cast Jace, and provided additional cards in hand to maximize your Jace-storm activation. This is the third critical synergy between Jace and Gush. The most common Vintage application of Jace is repetitive Jace-storming. When you Gush and then play Jace, you have not only gained mana and card advantage off of Gush, but you can then translate that into further card advantage with Jace. Gush gives you an additional land drop and draws two cards. Jace then draws three more cards, requiring you to put two back. In that turn alone, you’ve drawn at least six cards from your library (1 in your draw step, 2 with Gush, and 3 more with Jace). Then, you can put any superfluous land back into your library with Jace. That’s the kicker: the fact that Gush returns land into your hand allows you to put relatively unimportant cards into your hand for placement on top of your library with Jace’s +0 Brainstorm ability. This is a form of card advantage. It has the potential to functionally turn Gush into a spell that says draw four cards, instead of two, since the lands that return to hand translate into fresh cards drawn off the top of your library. This is the ultimate synergy between Gush and Jace. You put Tropical Island and Underground Sea on top of your library. Next turn you can play Underground Sea and cast Demonic Tutor, or hold up Mana Drain. If you want to shuffle away the land and then see three fresh new cards, you can do that as well. The point is that you will have generated tremendous card advantage, and will be well on your way to victory. All of these potent synergies are also presents in the Tyrant Oath presented in Understanding Gush, but the full rationale behind Jace was not explicated. I have now corrected that omission. The emphasis I accorded Jace in the context of Tyrant Oath was its synergy with Tyrant to generate virtually unlimited card advantage by drawing your entire deck. For more on that, see Chapter 7. The second thing to note about Shawn Anthony’s Gush Control list above is the permission suite. It’s a mixture of answers, without relying predominantly on any single solution. Shawn plays Mental Misstep, Mana Drain, Force of Will, and some blue bounce spells. Perhaps the most important innovation led by Shawn and his friends is Mental Misstep, which Rich Shay ran a full complement of at GenCon in the Vintage Champs. Mental Misstep introduced an intriguing weapon into the Gush arsenal. First and foremost, it is a form of tempo disruption, batting down Ancestral Recalls, Brainstorms, Spell Pierces, Duress effects, and even Preordains. Second, it does so at no mana cost, allowing the Gush pilot to resolve their Gushes and maximize their mana, putting it towards other uses. Third, it plays nearly perfectly into the aggressive Gush plan of resolving a critical bomb in the early game by denying the opponent a vital resource at a critical moment, whether it is a Preordain or a Spell Pierce. The final note I would like to make about the approach represented by Shawn Anthony’s list is the configuration of win conditions. Over the course of 2011, the players that have been running a list like Shawn’s have been experimenting with a variety of cards including Empty the Warrens and Tendrils of Agony. Note, for example, that Rich Shay ran Tendrils as a win condition. While Tinker into Blightsteel Colossus has remained a constant, secondary win conditions have varied. The list represented above, appearing in a tournament Top 8 just weeks before the Vintage Championship at GenCon, illustrates how Shawn and his collaborators have focused their vision and settled on using just Tinker + Blightsteel and Jace + Time Vault combo as win conditions. These are now the dominant win conditions and strategic objective one-two punch for Gush decks. Decks now only appear to be running Tendrils of Agony or Empty the Warrens if they feature dedicated storm engine cards above and beyond those present in a list such as the one represented above. For example, Rich Shay ran Tendrils, but he also ran Timetwister, another well-known storm engine. The key point here is that the range of strategic objectives pursued by Gush decks has narrowed as the variety of Gush shells has converged. Rich Shay and Shawn Anthony’s lists make a compelling case for how to design and approach Gush Control in its most potent configuration. Shawn’s list is perhaps the more streamlined and tuned version, and a great starting place for a well-tuned Gush Control list. Both lists emphasize the critical synergy left in the Gushbond engine Jace, and the vital support of Preordain. In some ways, this is reminiscent of the Gifts Ungiven decks of 2006. Instead of Merchant Scroll and Gifts Ungiven, they use Gush and Jace. They build towards a critical turn, and then overwhelm the opponent in card advantage. The convergence of Gush lists toward this basic shell is merely the first plot in the course of Gush decks in 2011. As strong as the Anthony/Shay/Martin shell has been, it is imperfect. These lists are susceptible to attack from competent Workshop pilots who might exploit their overreliance on Gush, and their inadequate array of answers. On the other hand, the emphasis on the critical big turn may leave these decks exposed to faster storm decks, like TPS, although Mental Misstep goes a long way towards shoring up that area of the metagame. In contrast to traditional Gush decks, these Gush Control decks eschew discard spells, historically a very popular and highly synergistic Gush tactic. What I find lacking in these lists is the absence of a strong early game (turns 1-3) built around Gush. That’s where having multiple Duress effects really shine. Instead, these decks use Gush to build towards other key plays on turns 3-4. I prefer decks that can use Gush more effectively to generate incremental advantage, which explains my preference for decks like Grow, where discards spells can become lethal tempo plays, and perhaps also explains the preference for Mental Misstep. In summary, I want my Gush deck to have a great turn two, a turn before you deploy Gush. That’s where I feel the current crop of Gush Control lists falls short. At the beginning of August I released my Q2 Vintage Metagame Report. That survey of the Vintage metagame prior to the Vintage Championship was astonishingly revealing. Two Jace decks were racing toward the summit of the Vintage universe: Confidant Jace Control and the Gush Jace Control decks discussed above. In the second quarter of 2011, Confidant Jace Control was, by a hair, the best performing archetype in Vintage (a complete analysis of this trend was conducted in the Q2 Metagame Report). Given that Confidant and Gush were the dominant draw engines in the format, what might happen if they were combined into the same deck? Might it produce a “super” Gush deck? Conventional wisdom suggested that Dark Confidant and Gush were so negatively synergistic that they were unplayable together. Since the restriction of Thirst for Knowledge, Dark Confidant had become the most prevalent source of card advantage in blue-based control decks. In fact, these lists were so successful that they won the 2009 and 2010 Vintage Championships. Most accomplished Vintage players had experience playing with these lists built around Dark Confidant, and were accustomed to how they played, and how to play against them. This experience taught most players just how tenuous the life loss could be with Dark Confidant, such that anyone who had more than a modest amount of experience with Confidant Control confidently concluded that Gush could not be added due to the risk of life loss. I count myself in their number. The problem with Confidant and Gush is that the risk of three large “flips” (meaning, upkeep trigger reveals) with Confidant put you in a precarious if not lethal life range. You need only flip any combination of a Force of Will, a Gush, and a Tinker robot to lose the game. With Jace, Force, and a Tinker target, the risk of this happening was already seen as unacceptably high. Adding Gush into the mix seemed implausible, at best, and preposterous at worst. Players unfamiliar with Vintage or with Bob Control decks, on the other hand, may not feel so hamstrung. They may not find the potential combination of Bob and Gush to be so implausible. It is the perspective the experienced blue based control pilot that leads one to the conclusion that Gush is not playable with Confidant. It is, I believe, for that reason that had not been seriously considered or developed until I tried my hand at it. That is not to say that this combination had not been attempted, but all previous attempts had been summarily rejected after a brief trial, or saw very modest success. Although this was an avenue of development I had wished to explore, the testing of my teammates led me to believe it was not feasible. Inspired by Jerry’s boldness, I decided to take a closer look at the issue. Conventional wisdom can be dangerously misleading, and if there was a way to make it work, I resolved to figure it out. I did. The first step in combining Confidant and Gush was attentiveness to life loss. This meant starting from the safest, most conservative list possible, and only adding more expensive spells as it became evident that the additional risk of higher mana flips could be safely incurred. Cards like Mana Crypt, Jace, Time Vault, Thoughtseize, and even Blightsteel Colossus would be kept in the binder until it was clear that the life loss could be effectively mitigated. Then, slowly, these cards were added back into the mix, in a methodical, scientific process, and trial and error. Ultimately, here is what I designed for the Vintage Championship and played to a 3rd place finish, losing only a mirror match in the Semifinals to my Team Meandeck teammate, Paul Mastriano (who avenged his defeat at my hands in the Swiss rounds). While Paul prevented me from winning the Vintage Championship again (the second time he’s done that to me), our performance with Confidant Gush proved its status as one of, if not the, top deck in Vintage in that tournament. This deck is a focused control deck. The sheer quantity of creatures is deeply misleading. They are each tactical. All of the creatures in this deck, except one, are included for reasons other than to deal damage to the opponent. I will explain this point later, but for now I want to emphasize the fact that this deck is a focused Blightsteel Colossus deck. The goal of the deck is to resolve Tinker and win the game with Blightsteel. Everything in it is geared toward that end. This fact was properly underscored in Wizards’ featuring of this deck in their Deck Tech coverage at Champs. Now I will explain the critical card choices in more detail. Dark Confidant – The fusion of Dark Confidant and Gush in to the same deck presents a combo of gigantic theoretical importance. Since two of the best performing decks in Vintage were Confidant Jace Control and Gush Control, fusing Gush and Confidant into the same deck meant that you could take the best from both lists and create a super-archetype. Dark Confidant is one of the best and most efficient unrestricted sources of card advantage in the format. For that reason, it’s arguably the best creature ever printed for play in the Vintage format. It’s simply a more efficient Ophidian, and an incredible source of incremental card advantage. If the game goes longer than 2-3 turns with Dark Confidant in play, and if the loss of life can be properly managed, then Dark Confidant will likely win the game. The card advantage generated by Confidant becomes overwhelming, and there is a reason that Confidant decks won the two prior Vintage championships. The card advantage generated from Dark Confidant is a tremendously attractive reason to play with him. But that does not make him an automatic inclusion into a Gush deck. As explained above, Gush’s high casting cost increases the overall mana cost of your deck, and most dangerously, dramatically increases the risk of three ‘expensive’ flips during the course of the game. However, in designing this deck, I was able to mitigate this risk in two critical ways. First, I ran a critical mass of library manipulation to control Bob flips. In particular, I ran 4 Preordains and 2 Sensei’s Divining Tops. Preordain and Top allow the pilot to manipulate the top of the library before each Confidant trigger, reducing the risk of high flips. The critical mass of Tops and Preordains means that roughly half of your Confidant triggers, or more, will be controlled flips. I tested and tuned the deck until I had discovered the threshold level of library manipulation spells needed to achieve this goal. Second, I play this deck aggressively. While it is a control deck, you need not sit on a Dark Confidant, turn after turn, generating card advantage. Rather, you must execute your game plan at the earliest possible opportunity. Rather than a pure Ophidian, Dark Confidant is here to build toward a critical mass of card advantage which supplements Gush, and thus fills a key early game role. Other Gush decks can do little else without drawing restricted cards until they fire off Gush. Dark Confidant is an excellent turn one or turn two play. In addition to filling a key early game role, Dark Confidant helps generate card advantage under otherwise oppressive conditions. This leads me to another key advantage of Confidant. The Vintage metagame at the time of the Vintage Championship had shifted in a few critical ways. In particular, Workshop pilots were running maximum amounts of Sphere effects, and Thorn of Amethyst in particular. For example, many Workshop pilots were running the Cat Stax list that Kevin and I had designed for our So Many Insane Plays Podcast. Thorn was being run to combat Ancient Grudge while not interfering with the development of the aggro-Workshop game plan. Dark Confidant is an excellent source of card advantage and board stability against Workshop decks, especially those with Thorn in them. Since Dark Confidant is unaffected by Thorn, Dark Confidant can serve the vital function of helping the Gush player generate card advantage under Thorns, something Gush is much less effective at doing. For example, Dark Confidant helps you find more land to break out of the soft lock, and is a highly efficient play. As long as Thorn is such a popular Sphere effect, Dark Confidant and cards like Trygon Predator will be valuable tactics. Finally, Dark Confidant is a warm body. The shift towards Slash Panther Workshop decks made Dark Confidant even more attractive. Dark Confidant can help generate card advantage and then trade with a Slash Panther or an opposing bear. I feel that the Anthony/Shay Gush list may be vulnerable to Aggro-Control strategies, both because of the pressure they can apply in the early game before the Gush engine comes online, and because of the mana denial they pack. Dark Confidant helps address both of these concerns, as any experienced Confidant pilot will attest. Dark Confidant is not all upside, however. As powerful as Dark Confidant may be as a source of card advantage, it takes time (read: turns) for that card advantage to mature. Against a more aggressive deck or a deck with a broken draw, playing Dark Confidant to invest in future turns may be a losing proposition if you must act now to save your hide. A turn two Dark Confidant is a weak play if your opponent is able to assemble the Time Vault combo or resolve Tinker on their turn. Thus, Dark Confidant must sometimes be deferred until a later time, increasing the opportunity cost of the slot. This is a good argument for running just three Dark Confidants, so that you reduce the probably of drawing multiples. Multiple Dark Confidants also expose the pilot to a much greater risk of making multiple high-cost trigger reveals. However, this fact must be weighed against the fact that Dark Confidant is at its best when played on turn one, and you want to maximize your chances of doing so. As the metagame shifts, Dark Confidant will wax and wane as a Gush tactic. In a field dominated by Cat Stax, it is a very potent tactic. In a field dominated by other Gush decks, it remains remarkably effective on turn one or two, but much less valuable thereafter, and must be played much more carefully. 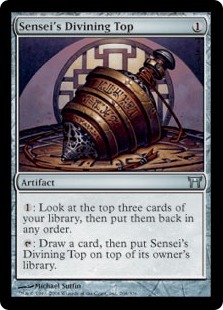 Sensei’s Divining Top – Sensei’s Divining Top is a strong card in its own right, but its function here is primarily to mitigate life loss with Dark Confidant. The Confidant Gush pilot can suffer several turns of uncontrolled Confidant triggers, but eventually a Top will have to be secured in order to minimize damage and to play into the end game. That is why I ran two Tops, although if other forms of library manipulation are included, a Top can be removed. The primary disadvantage of Top is that it is mana intensive in a deck that is mana hungry, and cheats as much as possible in terms of mana usage. Top also serves well against Workshops, since it can be played under Lodestone Golem, and since it can be used repeatedly under Spheres and Tangle Wires. In that circumstance, it’s better than Preordain. It’s kind of like playing under a fog; you can’t really play any spells, but you can nonetheless manipulate your library to expand your on-board mana base. Spell Pierce – Please refer the chapter of Understanding Gush where I discuss individual tactics. The only thing I will add to what is said there is that the metagame has shifted to the point where Spell Pierce is generally an unexpected play. While once a very popular play, Spell Pierce has waned in recent months, and virtually disappeared since this time last year. The inclusion of Spell Pierce was as much a decision regarding the principles described in Chapter 5 as it was a recognition of the fact that the metagame was ripe for using Spell Pierce. My pre-tournament testing repeatedly confirmed this. Spell Pierce may be less effective now that it is a known quantity (again), and given the increasing prevalence of Mental Misstep. Thoughtseize – Although I ended up not running Thoughtseize, it turns out that the life loss generated by Thoughtseize is acceptable, and Thoughtseize is an effective disruption spell in this deck. Thoughtseize is superior to Duress because it can take critical creatures in the Workshop match, as well as opposing Dark Confidants. Time Vault + Voltaic Key – Time Vault and Voltaic Key is arguably the strongest two card combination in the format, even more than Black Lotus + Yawgmoth’s Will. My initial suspicion was that this would be not be an effective combo to include because of the potential risks with repetitive flips with Dark Confidant. However, further testing alleviated these concerns. Time Vault is an excellent combo for this deck, and also serves the purpose of helping address the problem of naturally drawing Blightsteel Colossus, by giving you the mana and card advantage to get it into play. The only reason I did not include the Time Vault combo in my Vintage Champs deck was because I couldn’t decide what to cut. Paul Mastriano ran the combo over Vendilion Clique. 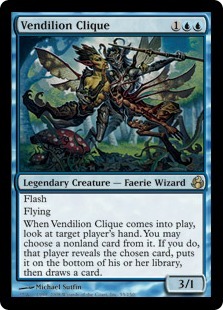 Vendilion Clique – All of the small creatures in Confidant Gush Control are tactical. The main reason I ran Clique was because testing had shown that I needed an effective way to get Blightsteel Colossus back into my deck. Since this is a focused Blightsteel deck, one of the problems with it is naturally drawing Blightsteel. Jace, the Mind Sculptor helps solve that problem as well, but is a 4 casting cost card. 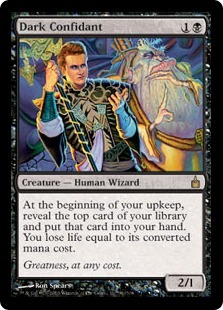 In addition, I felt that the metagame at GenCon would be gunning for Jace, and it would be more effective to run a surprise card like Clique than simply bank on a better card like Jace. Clique’s secondary function is as a Duress effect. Since I cut Thoughtseize from my deck, I wanted more ways to plan around my opponent’s hand and to interact on the stack. Clique does both, and can be timed to effectively act like a counterspell on the stack, but it provides the same information bonus as Duress. Third, Clique is an effective anti-Jace tactic, and can kill opposing Jaces. Finally, Clique can trade with other creatures, including Lodestone Golems, and can be played under Tangle Wires. Jace, the Mind Sculptor – I have already explained why Jace is so effective in a Gush deck, so I need not repeat myself here. I will only note that the night before the tournament, I agonized over whether to include two Cliques, two Jaces, or Time Vault + Voltaic Key. I settled on Clique because it seemed to do the most with the lowest risks, although Jace and/or Key provided more potential upside. I was also concerned that the entire metagame would be aiming at Jace, so I felt that Clique might be a better metagame choice. In the future, I would run at least one Jace in this deck, if not two. In fact, no sooner had the tournament concluded than both Paul and I had reached that conclusion independently, and Chris Pikula’s version of this deck with two Jaces provides an exclamation to that point. Trygon Predator – In testing before Vintage Champs, it became increasingly apparent that Ancient Grudge was no longer an effective solution to Workshop strategies because of the density of Sphere effects. It was now possible, with 13 Spheres + Phyrexian Revoker, to prevent an opponent from ever casting Ancient Grudge. At the same time, I realized that these decks were susceptible to Trygon Predator because 1) Predator is proactive, and can be played on turn one or two (especially after you Force the first threat), and 2) is unaffected by Thorn of Amethyst. And once it resolves, it effectively wins the game unless the opponent has Metamorph, which is only 3-of in some lists. 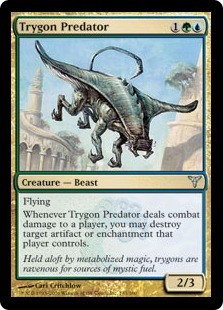 Trygon Predator is notable for being a key ingredient to Owen’s 2010 Vintage Championship list. However, Predator went away when Workshop players last fall shifted to the big mana Metalworker lists with Steel Hellkite. But with Steel Hellkite, Triskelion, and other big mana creatures disappearing, Trygon became our simple metagame solution. Ultimately, then, Trygon’s main purpose was strategic. It was my primary strategy against Workshops. Resolving and shielding a Trygon turned into the best plan against Cat Stax. Testing other configurations proved ineffective at defeating this menace, a menace I had inadvertently helped create. Trygon Predator, combined with Hurkyl’s Recall and other sideboard answers, proved to be more than Workshop decks could handle. The biggest thing that Workshop players underestimate when encountering Trygon Predator is the first point I made above: that it is proactive. Workshop players are used to dealing with answers that are reactive, that can be stymied from the outset. It takes only a modest amount of mana acceleration to resolve a turn one or turn two Predator, fast enough that the Workshop pilot may have little opportunity to add Sphere effects to the board first. How often do you think this hand is able to resolve Predator? On the play? On the draw? Substitute Fastbond for Spell Pierce, and see how your answer changes. Substitute Mana Crypt (and then Black Lotus) for Mox Emerald and see how your answer changes. Finally, suppose your opponent’s turn one play is Thorn of Amethyst. Imagine you have Dark Confidant in the mix, and you can see how things become very tricky for your opponent. If you are on the play, there is almost nothing they can do. On the draw, they have at best a 50-50 chance of being able to stop you from tearing them apart. I expect that Trygon’s value will diminish in the post-Champs metagame, given the success Paul and I both had with it. One of the errors that players make is to take a successful tournament decklist and play it card-for-card, without considering how metagame shifts may undermine some of the card choices. My Vintage Champs list is a cautionary warning about those dangers, given how sensitive many of my card choices were to the nuances of the then-extant metagame. Flusterstorm – AKA the Stack-Breaker. Another more recent tactic which I’ve championed in Gush decks is Flusterstorm. Although it is not represented in the above lists, it remains a critical tactical option which you should always bear in mind. The potential upside on Flusterstorm is enormous, generating card advantage while serving as an uncounterable solution to the stack. For a detailed discussion of the merits of Flusterstorm, listen to the first So Many Insane Plays Podcast. It’s most potent in Gush decks, since they are so adept at generating storm. 1) Jace can and should be included. It took a major tournament to demonstrate this, and should be included over the second Top, which performs a similar function. 2) Time Vault should obviously be included, especially now that Jace is coming in. 3) Trygon Predator will be less effective going forward, especially now that Workshops will be increasingly prepared, and since Workshops seem to have receded post-Champs. 4) Spell Pierce is also less effective, but it’s not clear whether it should be replaced, just yet. I have some things in mind, but they would require further testing. In the meantime, I would keep Spell Pierce. Confidant Gush, as an unexpected innovative combination, may appear to some as a pinnacle in the evolution of Gush decks this year. It combines the two most potent draw engines in the format into one monster deck. If history is any guide, this is merely the next stage in the evolution of Gush decks, and not the final step. There are many possible directions for exploiting the ever-evolving Vintage metagame, and I plan to uncover them.